Good morning. It gives me great pleasure to be here today for the opening of the Economic Times Asian Business Leaders Conclave. 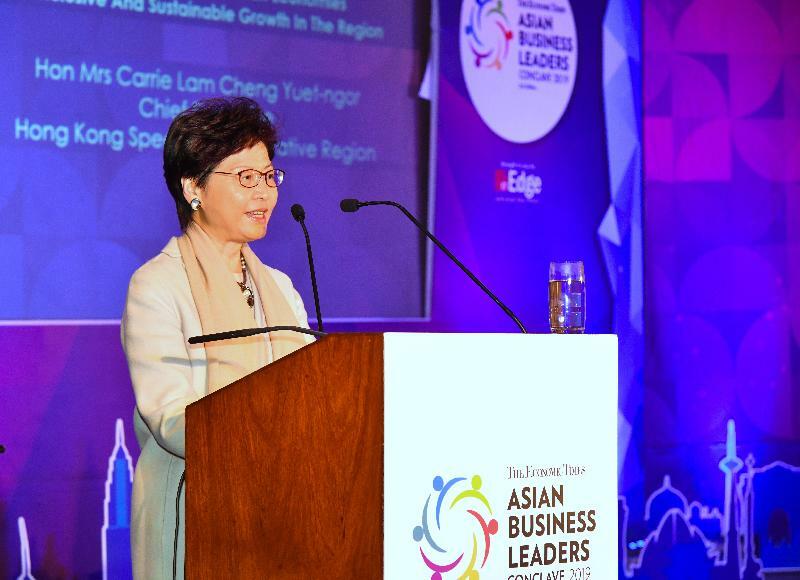 I understand that this is the third edition of this very exciting event and I hope that Economic Times of India will come back more often to Hong Kong for this gathering of the Asian business leaders. On behalf of the Hong Kong Special Administrative Region, I'm delighted to welcome you – some 500 business, finance and government leaders from all over the world – to Hong Kong for this Conclave, under the timely theme of "Rethinking Asia." This is a welcome opportunity to focus on sustainable and inclusive growth for Asia. You're certainly in the right place at the right time. Since taking office in July 2017, I have been advocating new roles of the Government in order to scale new height and we have adopted a new tagline for branding our city, and that is, to connect and excel. Indeed, you can say that we are reshaping our city for the economic promise that this 21st century will surely bring the countries and economies of Asia, Hong Kong very much included. Of course, we remain the world's bridge between East and West, as between Mainland China and the rest of Asia. Our role of connecting companies, economies and cultures continues to grow, and we continue to find fresh ways of helping businesses and people to excel, whatever it is they're building or pursuing, whatever their ambitions or their vision. Thanks to our deepening economic integration with the Mainland, we are also taking full advantage of two national strategies of Mainland China to build on our world-class strengths in financial and professional services, and to develop, as well, our fast-emerging innovation and technology sector. I'm talking about the Belt and Road Initiative and the Guangdong-Hong Kong-Macao Greater Bay Area. I will be happy to tell you more about these opportunities in a few minutes. But let me first give you a brief update on Hong Kong. Our economy, I'm pleased to say, expanded by 2.9 per cent in real terms in the third quarter of 2018, marking Hong Kong's eighth consecutive quarter of above-trend growth. Through the first three quarters of 2018, our economy grew by 3.7 per cent, year on year. Due to some external factors, economic growth for 2018 as a whole is forecast at a moderated rate of 3.2 per cent. And our unemployment rate remains at 2.8 per cent, which is a 20-year low. I would say that these figures are more than respectable, given the ongoing uncertainties of the global economy. Thanks to our open and externally oriented economy, we have been a global leader in trade. In 2017, our exports and imports of goods and services amounted to better than 370 per cent of our GDP. That year, Hong Kong was ranked the world's seventh-leading trading economy, our trade totalling US$1.14 trillion – up 7.15 per cent over the previous year. We continue to be closely linked with the economies of Asia. Indeed, nine of Hong Kong's top 10 trading partners are from Asia, and they accounted for US$912 billion, almost 80 per cent of our total merchandise trade in 2017. Those numbers, and our focus on Asia, will surely expand down the road. Asia, after all, accounts for more than 60 per cent of global growth, according to the International Monetary Fund. Last year's full-year results are not yet in, but growth in Asia in 2018 is expected to reach a laudable 5.6 per cent. This year, the IMF projects Asian growth at about 5.4 percent – still considerably higher than the projected global average of 3.7 per cent. In short, the fast-growing Asian market presents huge potential and myriad business opportunities for all of us. The Hong Kong Government maintains 12 overseas Economic and Trade Offices (ETO), including Tokyo, Singapore and Jakarta in Asia. That's not nearly enough, not if we are to take advantage of the expanding business opportunities in Asia. Which is why we have announced that we are planning to add five new ETOs, three of them in Asian cities: Bangkok, Mumbai and Seoul. Among them, I'm pleased to say that the Bangkok ETO, which is the most recently announced one, is going to open soon, hopefully in February this year. We also hope to set up the Mumbai ETO soon. For this, I look to the Consul-General for his support. Hong Kong and India have strong, long-established ties, both economically and culturally. Hong Kong is home to a large Indian community and many Indian companies. And we greatly value and treasure the manifold contributions that the Indian community has made to Hong Kong over the decades. In 2017, our bilateral trade reached US$34 billion, up 27 per cent over 2016 results. I'm confident that, with the new Mumbai ETO in India up and running, our bilateral ties will reach new heights in our business, trade and cultural cooperation. Hong Kong's working philosophy, whether in enhancing ties with India, the Mainland, the rest of Asia or the world beyond, focuses on the mutual rewards that open, inclusive and sustainable growth can realise. That considered approach is supported by our unique advantages under the "One Country, Two Systems" principle. Thanks to "One Country, Two Systems", Hong Kong maintains an open and free market, a simple and low tax regime and a level-playing field for companies. For the past 24 years in a row, the Heritage Foundation has named Hong Kong the world's freest economy. Last year, we finished second worldwide in the Swiss-based International Institute for Management Development's World Competitiveness Yearbook. And in this year's World Bank "Doing Business" report, we placed number four. Our attractiveness to overseas business is visible in the increasing number of offices set up by international companies in Hong Kong. At last count, more than 8 700 businesses with parent companies overseas or in Mainland China maintained an office here. That, ladies and gentlemen, is up 6.4 per cent, year on year. Let me add that nearly 50 per cent of them have parent companies based in Asia. Further, among the 8 700 businesses, 1 530 are regional headquarters, increased by 8.3 per cent, year on year. Hong Kong has long been the business bridge for foreign investors seeking access to the Mainland market. Our gateway position was appreciably strengthened by CEPA, the Mainland and Hong Kong Closer Economic Partnership Arrangement. As a free trade agreement, CEPA was first established in 2003 and enhanced in the years since then. CEPA provides preferential treatment to Hong Kong service suppliers, as well as tariff-free treatment for products of Hong Kong origin. The beauty of CEPA is that it is nationality-neutral. That means overseas companies need only partner with Hong Kong or set up an office here to realise CEPA's wide-ranging business advantages. We are, as well, expanding our network of free trade agreements, investment agreements and comprehensive avoidance of double taxation agreements with foreign economies. Since I took office as Chief Executive in July 2017, my Government has established free trade agreements with the Association of Southeast Asian Nations (ASEAN) and with Georgia. We have, as well, recently concluded negotiations with Australia and the Maldives. I'm determined to realise more free trade agreements in the years to come, in order to enhance prospects and opportunities for Hong Kong companies and service providers, as well as our business partners. While upholding the principle of "One Country, Two Systems" and taking advantage of our unique strengths, Hong Kong is geared up to integrating herself into the national development strategies. And this includes President Xi Jinping's commitment to building open and inclusive relations among countries and peoples. I was in Shanghai last November for the inaugural China International Import Expo. There, President Xi delivered a keynote address entitled "Work Together for an Open Global Economy that is Innovative and Inclusive." In his speech, President Xi emphasised, and I quote, "China's consistent position of supporting the multilateral trading system and promoting free trade." President Xi added that "openness and cooperation will remain essential for continued human progress." President Xi's embrace of multilateral co-operation and the shared benefits it can bring is powerfully reflected in the Belt and Road Initiative and the international connectivity it enables. Our strategic location and status as an international trading and financial services centre make Hong Kong the ideal springboard for overseas companies looking to tap the resources, the markets and the opportunities that the Belt and Road affords. Hong Kong enjoys distinct economic, legal and social systems. They are backed by a deep pool of professionals. Their expertise ranges from infrastructure development and engineering to consultancy, accounting, law and more, and their global networks and affiliations are extensive. No less important, they are well versed in cross-border business transactions. They can make all the difference for countries and companies taking part in the Belt and Road Initiative. Our strength in financial services is powered by capital formation. Thanks to our liquid capital flow, Hong Kong is the natural centre for those looking to raise capital for infrastructure, as well as production and investment projects. In particular, Hong Kong is well positioned to respond to green financing needs. In the coming months, we will launch a government green bond issuance programme. It will come with a borrowing ceiling of about US$13 billion, making it one of the world's largest sovereign green bond issuances. We have also initiated a Green Bond Grant Scheme that subsidises the costs issuers incur in obtaining certification under our Green Finance Certification Scheme. In short, Hong Kong has what it takes to become a fund-raising hub for green projects, and I'm confident our bond market will attract Belt and Road investors. Alongside our financial acumen, Hong Kong is a hub for risk management, insurance and dispute-resolution services. Our legal services sector is renowned. Its foundation is the rule of law, underpinned by an independent judiciary and robust intellectual property rights protection. Arbitral awards made here are enforceable in more than 150 jurisdictions, including the Mainland. Hong Kong boasts more than 13 000 lawyers, and many more legal professionals. They come from all over the world, and their services range from risk assessment and the drafting of contracts, to dispute resolution for investment and commercial deals. The connectivity that drives the Belt and Road extends well beyond infrastructure or the business and trade it enables. Building people-to-people bonds is also one of the key objectives. Such bonds must, of course, be inclusive, if they are to be meaningful. That, unfortunately, is not always the case. Despite the remarkable socio-economic transformation of Asia in recent decades, the gains have not always benefited those in need. The result is communities, regions and economies experiencing more, not less, inequality; more, not less, environmental degradation. If economic development is to become more inclusive, we must find ways of expanding essential needs, ensuring that our societies have access to such basics as safety, equity and justice. In that regard, ladies and gentlemen, Hong Kong has much to offer. And we are happy to share our experience and to help emerging economies build their capacity. I see it as part of our contribution to expanding people-to-people bonds, whether in the Asian region or in the broader reaches of the Belt and Road. It begins with our city management expertise. That ranges from town planning and railway operation, to flood prevention, slope stabilisation, aviation safety and emergency services. We have, as well, the institutions and the experience to promote equal opportunity, deal with administrative complaints and fight corruption. Indeed, some of our institutions, from the Independent Commission Against Corruption to the Fire and Ambulance Services Academy, offer training and experience-sharing with their counterparts in Asia, including Belt and Road economies. The Independent Commission Against Corruption, for example, has in place a dedicated unit providing training services for anti-corruption agencies in Belt and Road countries. Similarly, our Fire and Ambulance Services Academy has helped train firemen, for example, from Vietnam, and the Academy welcomes opportunities to work with other Asian and Belt and Road economies. It's much the same with the Hong Kong Airport Authority and its aviation academy, as well as our MTR Corporation, which has established a rail academy. Their doors, ladies and gentlemen, are always open. Such capacity building helps promote inclusive growth. That in turn can only strengthen confidence in the Belt and Road Initiative and the welcome co-operation it offers us all. Ladies and gentlemen, you can learn more about the prospects and the promise of the Belt and Road Initiative in September, when Hong Kong hosts its fourth Belt and Road Summit. The Summit is now the largest, most important annual gathering among Belt and Road project owners, investors and service providers. The third Summit held in June last year attracted about 5 000 government and business leaders from some 50 countries and regions. Allow me now to briefly touch on the other important national strategy of Mainland China, which is the fast-rising Guangdong-Hong Kong-Macao Greater Bay Area, the development plan of which will soon be promulgated. The Greater Bay Area covers Hong Kong, Macao and nine prosperous Guangdong cities, bringing together a collective population of about 70 million, and a GDP of more than US$1.5 trillion. While the Greater Bay Area accounts for only five per cent of the Mainland's population, it is responsible for fully 12 per cent of the Mainland's GDP. That's equivalent to the GDP of Australia or Korea. Air passenger and cargo throughputs of the Greater Bay Area rank first among the world's major bay areas. While the New York, San Francisco and Tokyo bay areas may pride themselves on their status as financial, technology and industry hubs respectively, the Greater Bay Area encompasses all of that. The Greater Bay Area is built on complementarity instead of competition among the cities. Hong Kong, China's most international city, will play the role as an international finance and trade hub, as well as a global arbitration centre. In addition, we look to contribute to the Greater Bay Area's development into an international innovation and technology hub. Hong Kong has much to offer, including world-class universities and scientific research capabilities. We have, as well, a government, and a Chief Executive, that places Innovation and Technology at the heart of our policy agenda in this 21st century of endless change and boundless promises. Combined with the strengths of Mainland cities such as their advanced manufacturing capability, the Greater Bay Area has all it takes to become Asia's Silicon Valley. We welcome talent, technology enterprises and scientific institutions from Asia and from all over the world to join us. Ladies and gentlemen, Hong Kong treasures its place in the Asian community, and I look forward to building even stronger ties with you in business and trade, in culture, in innovation and technology, education, travel and so much more. Finally, my thanks to the Economic Times of India for bringing this seminal, Asian-wide gathering to Hong Kong. And with Chinese New Year – the Year of the Pig – fast approaching, may I wish you all good health, happiness and prosperity. Thank you very much.